Volunteers Survey For This Rare and Elusive NJ Salamander. On a cold December evening I met up with ENSP biologists and dedicated Tiger Salamander project volunteers to survey for Eastern Tiger Salamanders. The group had been out surveying all day in Atlantic County without spotting any tiger salamanders and were cold but still raring to go. The pool we surveyed has been a successful tiger salamander breeding pool, within a complex of enhanced vernal pools. We weren’t disappointed as we quickly found adult salamanders in the pool and egg masses. Another great find was a neotenic (gilled adult). This was a larvae, most likely, from last season that didn’t metamorphose and still had external gills. It had not yet left the pool, whereas most larvae metamorphose and leave the pools in June to July of their hatching year. We surveyed a second pool in the complex, but found no sign of adults or egg masses. We found fish in the pool, which is an indicator that there won’t be salamanders since the fish eat the eggs and larvae. New Tiger Salamander breeding pools have been found by the TS volunteers, in Cape May and Cumberland Counties. It is encouraging to know that these salamanders continue to live and breed in New Jersey and that gives me hope for the future of all NJ wildlife. 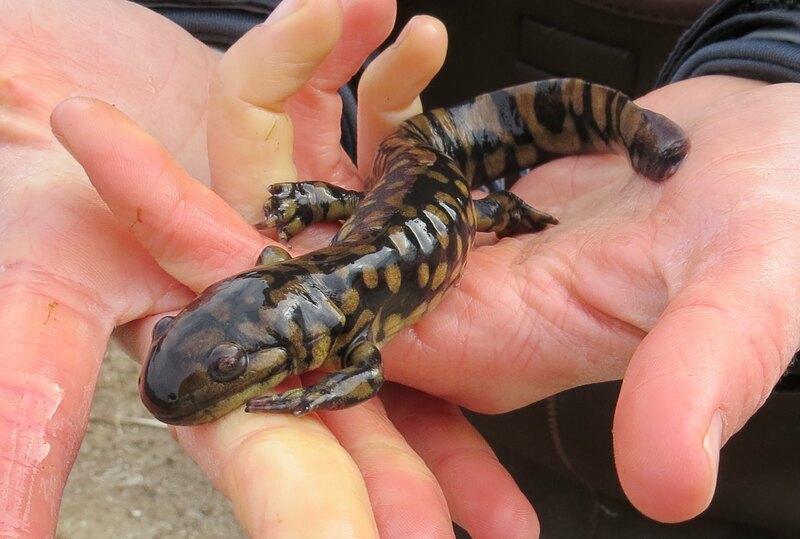 Conserve Wildlife Foundation’s Blog: Headstarted eastern tiger salamanders released in constructed pool in Cape May! It’s the time of year when Conserve Wildlife Foundation biologists and volunteers along with Endangered and Nongame Species biologists start to survey for New Jersey’s “tigers,” and by tigers I don’t mean the big striped cats, we’re talking about the Eastern Tiger Salamanders. These large mole salamanders spend most of their life burrowed under the ground and in December begin to emerge to migrate to vernal pools and breed. Eastern Tiger Salamanders are endangered in New Jersey and only found in 15 pools in the most southern part of the state. Last week dedicated volunteers Wayne Russell, John King and myself went out to check on a few known breeding pools. The water level in the ponds was lower than usual due to the lack of rain, but John found an adult male in one of the pools. We were delighted to find a male in the pool so early in December. At another known breeding pool we found the partial remains of two Eastern Tiger Salamanders that had obviously been eaten by a predator. But the good news was that we also found two tiger salamander egg masses in the same pool. Predation is just one of the challenges that these salamanders face. Tiger Salamanders themselves are targeted by collectors for the pet trade which is why their breeding locations are kept a secret. Their habitat is declining due to habitat loss and fragmentation, development, pollution, changes in hydrology, and climate change. Larissa Smith is a wildlife biologist and volunteer manager for Conserve Wildlife Foundation of New Jersey. Male eastern tiger salamander found 12/19/14 in vernal pool complex in Cape May. Eastern tiger salamanders are starting to move to their breeding pools. The Conserve Wildlife Foundation of New Jersey, the State Division of Fish and Wildlife Endangered and Nongame Species Program, and a dedicated group of volunteers will be surveying the pools over the next few months to determine populations.